A spirited India went down fighting to an in-form England side in a Pool B encounter of the Hockey World Cup in New Delhi on Saturday and crashed out of the semifinal race. It was India's third straight defeat following the lone win over Pakistan in their opening match. Going into the match England and India had met six times in the World Cup with the former winning twice and the latter on three occasions. However, to England's advantage, they had won their last two World Cup encounters with the hosts, whose last win in the tournament against the visitors came way back in the 1994 edition. And it was the visiting team that took a healthy 3-0 lead before the hosts could mount a fightback. 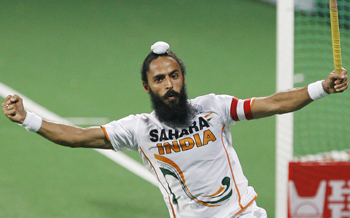 Down and out, India hit back in the 54th minute, Gurwinder Singh Chandi latching onto a cross from Gurbaj Singh to score his first goal of the tournament. Four minutes later, a terrific team effort ensured the hosts' their second goal. Shivendra Singh, back from a two-match suspension, passed Sarvanjit Singh who in turn set it up for captain Rajpal Singh to deflect the ball home and reduce the arrears to 3-2. But the home side, despite many efforts, failed to find the equaliser. Pakistan slumped to their worst defeat in the tournament when a lowly South Africa stunned the Asian giants 4-3 in a must-win Pool B match to shatter their semifinal dreams. Australia continued with their impressive form after the initial hiccup and inched closer towards a semifinal spot beating Olympic silver medallist Spain 2-0 in a crucial Pool B match. With this victory, Australia not only pocketed three vital points but also took revenge of their semifinal defeat at the hands of the Spaniards in Beijing Games. 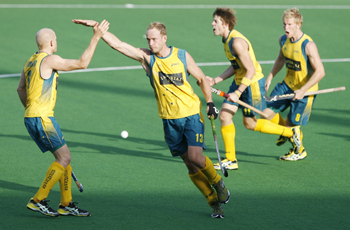 Luke Doerner converted his sixth short corner of the tournament in the 20th minute and then Glenn Turner doubled the lead for the Aussies in the 60th minute. The win almost assured Australia a place in the last-four stage and a draw against Pakistan in their last match on Monday would be more than enough for Ric Charlesworth's boys to secure their place in the semifinal.